Dave in Madison, Wisconsin called in to tell of an amazing sighting that he had with his son. 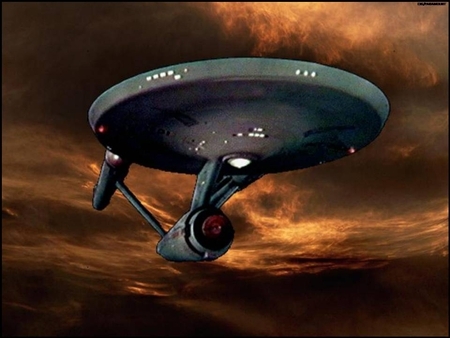 It's interesting that just last year MUFON had received a report from a witness who described seeing what looked like the Starship Enterprise. Pop star Selena Gomez searches for ghosts wherever she goes. The 23-year-old beauty has previously confessed she believes in supernatural spirits and uses a special ghost app to hunt them down. During an interview with US talk show host Jimmy Fallon on the Tonight Show on Wednesday (14Oct15), Selena couldn’t resist using her cell phone to detect spooks around the set. As Selena ran the test, Jimmy admitted he was feeling scared and reluctantly looked at the cell phone screen as it showed strange wave formations and random numbers. His uneasiness was only heightened when a sinister voice said the word ‘children’ just seconds after Selena had opened the app. The singer has made no secret of her fascination with the spirit world and recently revealed to Billboard magazine that she uses the phantom app because she enjoys feeling scared. When Jimmy attempted to make light of the findings, Selena was quick to defend its validity. She regularly scouts locations for other beings and insists the app has previously mentioned people she knew “by name”. STE. GENEVIEVE, MO (KFVS) - Do you believe in ghosts? One Ste. Genevieve, Mo. husband and wife say they've been living with ghosts for years, and they have proof to back it up. Parts of Ste. Genevieve date back centuries, but for Bob and Stacy Browne, they say there's more than just history in their 210-year-old home. "Yeah, they're not going to leave," Bob Browne said. The Brownes say they have encounters with ghosts in their home on a regular basis. "It doesn't bother us none," Browne said. They say it can be as simple as touch on the shoulder or sounds of footsteps coming from upstairs when no one is there. Audio recordings compiled by paranormal investigators in the home appear to capture messages from another realm. Records show the home belonged to Dr. Walter Fenwick in 1805. He used it as a residence and office. He lived there with his wife and son, Zenon. Does SECRET TUNNEL discovered under Berlin prove Hitler SURVIVED WW2 and fled Germany?